New technologies of warfare and forms of mass media and propaganda to disseminate news of combat are among the elements that cause the Spanish Civil War to be considered the first thoroughly modern war. Poetry, a very traditional literary form, also played an important role of dissemination in the conflict, providing a large body of works that portray both idealism and a sense of catastrophe. The April 1937 bombing of the Basque town of Guernica and its repercussions exemplify these characteristics. The far-reaching impact of the destruction of the town can be attributed to the wide press coverage the event received. War correspondents like George Steer of The Times presented the air raid in alarmist tones, emphasizing how the event could be read as a rehearsal of Nazi Germany’s total war strategy. 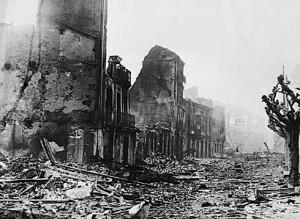 Steer’s articles suggested that “Guernica” was more than an allegory of defeat and terror wielded against a civilian population. Soon after the bombing, Pablo Picasso’s mural Guernica—modern art’s most powerful anti-war statement –punctuated the phenomenon by seizing the symbolic force of the event and transforming it into a representation of the violence suffered in Spain, and the imminent danger non-intervention posed for democracies of the world. The motif of the devastated town also appears in numerous poems written by British and American, some of them combatants, journalists, humanitarian relief workers or simply activists against the non-intervention policies of Western democracies. Since the unveiling of the mural by Picasso, writers have used ekphrasis, that is, the strategy of using words to describe art, to include the name Guernica in poetry. Poems about the painting have come to take the place of those poems that had initially condemned the bombing itself. At the same time, Guernica here evokes the fate of a martyred city beyond its Basque context. The dead children represents the civilian victims of air raids, a symbol found in poems about the Spanish war by writers of all nationalities. If indiscriminate bombing works as a tool to instill terror, images of its bloody effects are the most direct means of representing a horror that at once invites repudiation and foments a foreboding of terror in places that have not been subject to combat. Those dead children in the streets of bombed Spain, the poems charge, could be soon British and American children. The painting Guernica was also envisioned as an instrument of persuasion to encourage Western democracies to intervene when the Republican government commissioned it for the Spanish Pavilion at the 1937 Paris Universal Exposition. Coinciding with the destruction of the town, Picasso takes up the immediate repercussions by applying the title to his painting that otherwise makes no direct references to the concrete event. Any bombed Spanish town could be the one depicted on the enormous canvas. The sense of allegory projects the evils of modern warfare, whose principal victims are civilians, continues into the present: its figures are re-contextualized to protest against unjust conflicts: any bombed town in the world. Precisely in 1937, when the Spanish war came to be seen as a pre-amble to greater conflicts, the painting became a motif of poetry, of the fatal allegory evoked by the name of a single city. Another Scotsman, J.F. Hendry, proposes a somewhat more complex interpretation in “Picasso: for Guernica ” by physically entangling the poet-viewer with the figures on the canvas. Starve frank stroke and stave the hooves of bulls. These poems form the core of a long list of works in which Guernica substitutes the geographic place name as a literary motif. Such displacement allows the representation to signify universally the disasters of modern, mechanized warfare across borders and time. And yet, the poetry that takes Guernica as its theme never ceases to be a reaction to the reality of destruction that inspired the painter, and this is a reality of existing places locatable on a map, albeit an allegorical one, for those fearing fascism beyond their borders. Aaron Kramer attaches the following clarification to the title of his poem “Guernica” that appeared in the 1945 collection Thru Our Guns: “Holy City of Spain destroyed by Fascist bombs” (Nelson 170). This poet announces his dual intention of commemorating the event and of recovering it from the allegorical meaning projected upon by the painting following its installation at the MOMA in New York. He invites readers to recall the way in which the painting, not mentioned in the poem, is a work of art that permanently memorializes the event but that is nonetheless overshadowed by its status as a universal symbol of anti-war sentiments. In efforts to downplay the dimensions of the crime, conservatives have derided the role of mass media and art in the defining the significance of Guernica internationally. The motif is hardly present in war poetry by Spanish writers of the period. Such absence can be explained by observing that destruction and defeat did not serve the same purpose for poets whose task it was to sound the battle cry and raise morale, mostly in an epic mode, as it did for foreigners seeking to call attention to horrors taking place elsewhere. Only in the context of exile, did the name of the ravaged city become a poetic theme for the generation of Spaniards that had fought in the war. By then the civil conflict had lost its immediate significance as a harbinger of future catastrophe; it was instead a lost cause that needed to be remembered. Elena Cueto Asín is Associate Professor of Romance Languages at Bowdoin College. Cunningham, Valentin. Ed. Penguin Book of Spanish Civil War Verse. London: Penguin, 1980. Dietz, Bernard. Un país donde lucía el sol. Poesía inglesa de la guerra civil. Madrid: Hiperion, 1981. López Ortega, Ramón y Román Álvarez Rogriguez. Eds. Poesía anglo-norteamericana de la Guerra Civil Española. Salamanca: Junta de Castilla y León, 1986. Nelson, Cary. Ed. The Wound and the Dream. Sixty Years of American Poems about the Spanish Civil War. Urbana: University of Illinois Press, 2002. Oppler, Ellen. Picasso’s Guernica. New York: Norton, 1988. Rosten, Norman. The Fourth Decade and Other Poems. New York: Farrar & Rinehart, 1943. Shand y Girri. Eds Poesía inglesa de la guerra civil española. Barcelona: Ateneo, 1947.